One of the 2017 heroes of Concord Times Communications, Retired Honourable Justice Edmond Cowan, has on Wednesday passed away after a short ailment. 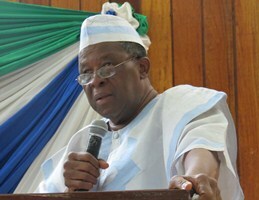 The Retired Honourable Justice Edmond Cowan is the immediate past Ombudsman of Sierra Leone. He chaired the 80-man Constitutional Review Committee tasked with reviewing the 1991 Constitution. The erstwhile appellate court judge was Sierra Leone’s Speaker of Parliament from 2001 to 2007, and acted as president on a number of occasions. From 1999 to2000, he was sole commissioner appointed by the government to enquire into activities of the Sierra Leone Telecommunication Company, award of government contracts, re-furnishing of government quarters and buildings. Justice Cowan has served as legal practitioner, jurist and lawmaker spanning over 45 years. He worked as Principal State Council at the Law Officers Department prior to becoming a judge. Before then, he had served as private legal practitioner for over nine years. He was Legal Adviser/Secretary at the Sierra Leone Produce Marketing Board (SLPMB) from 1981 to 1989. Justice Cowan deserves recognition for his inimitable contribution to national development and valiant service to mankind. In 2017 in particular, the respected jurist has shown tremendous courage even in the face of calumny and vitriol to defend the draft report that his 80-man committee had put together. The committee’s report, which took three years and $5 million in budgetary allocation, has been rendered nugatory by a government eager to impose a de facto ‘constitutional one-party rule’. In the current dispensation, many will be forgiven to have envisaged that the CRC chairman would play ball. But the apolitical ‘Solomon’ has proved his doubters wrong, much to the consternation of ruling party apparatchiks, that he has his country at heart and wanted to leave a rich legacy by way of a constitution that bestows sovereignty to the people and guarantees fundamental freedoms to all, including youth, children, and women. While on Radio Democracy last week, all but few listeners applauded his courage and love for country as he denounced attempts by the government to scuttle the most participatory and democratic constitutional review process in the history of post-independence Sierra Leone. In view of his bravery and courage, the editorial team of Concord Times wishes to bestow on Justice Cowan “Hero of 2017”.